I had the honor and pleasure to venture to the home of fellow gamer, Scott Newberry, and play FUBAR Fantasy. For those of you who may not know, FUBAR is a set of free, one-page rules found at The Game Shed. The core set of rules is set up for sci-fi, but there have been many adaptations to encompass several genres. To me, the game is a bit Ganesha Games Song of... series with other rules elements thrown in for good measure. Anyway, I had never been to Scott's house and thought I'd go and have a bit of fun. The night was originally going to be three of us playing FUBAR, but one fellow was sick and bowed out. That left Scott and myself. The scenario was straight-up fantasy: good guys vs bad guys. 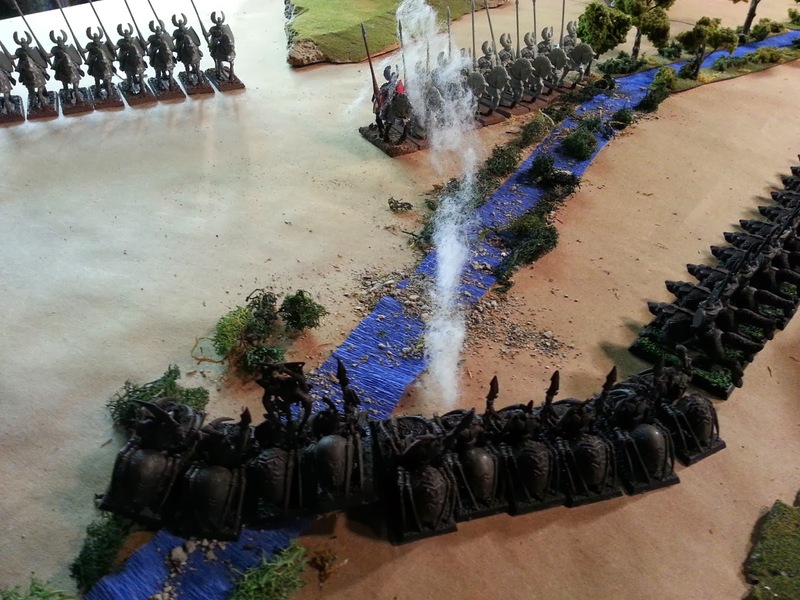 The good guys (played by Scott) included elven archers, dwarven axemen and mounted and dismounted heavy knights. The bad guys (played by me) were comprised of orc swordsmen, orc archers, trolls, a squad of mounted chaos knights, goblin warg riders and goblin spider riders. Each side also had a catapult to fire upon their enemy. 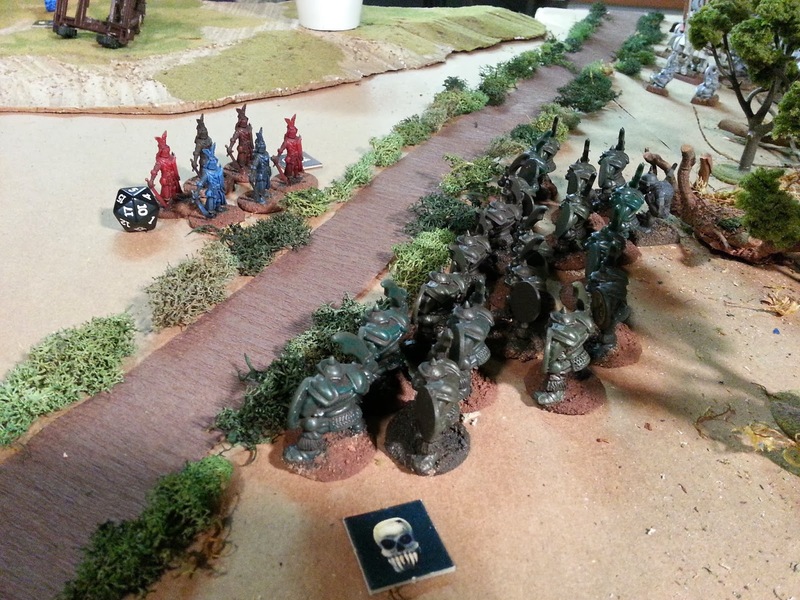 I tried to move quickly on the left flank, but poor rolls inhibited my riders' speed. I did manage to bring them up to the river's edge after a few turns. 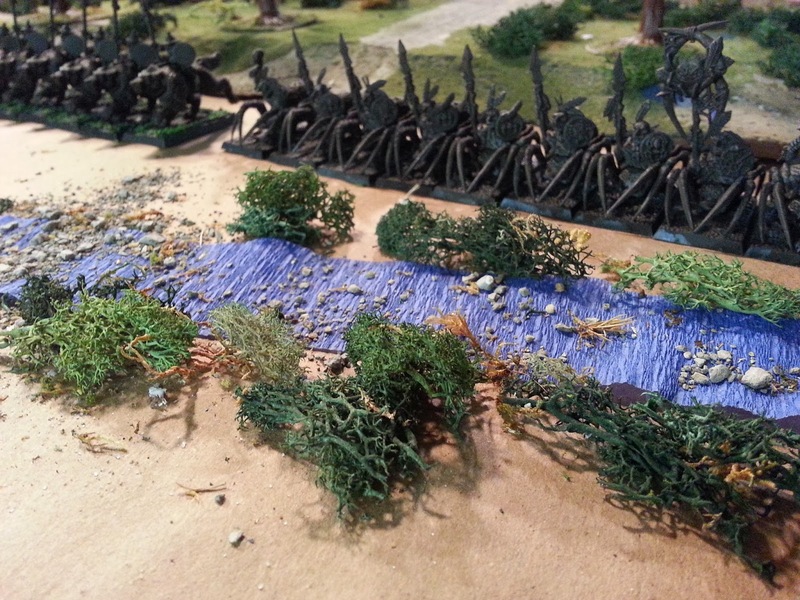 Scott, on the other hand, didn't move his heavy cavalry until I was almost to the water's edge. 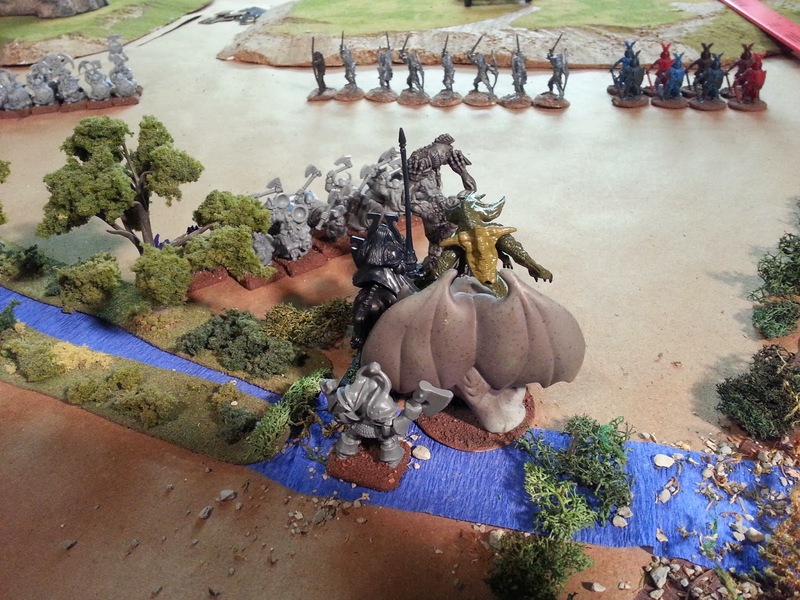 In the center, I began the fray by moving my chaos knights up to the fjord, with the trolls following closely behind. Scott promptly picked my knights apart with elven arrow fire, leaving me with a sole knight, quivering on the bank of the river. I also tried to fire my catapult, but it broke down! 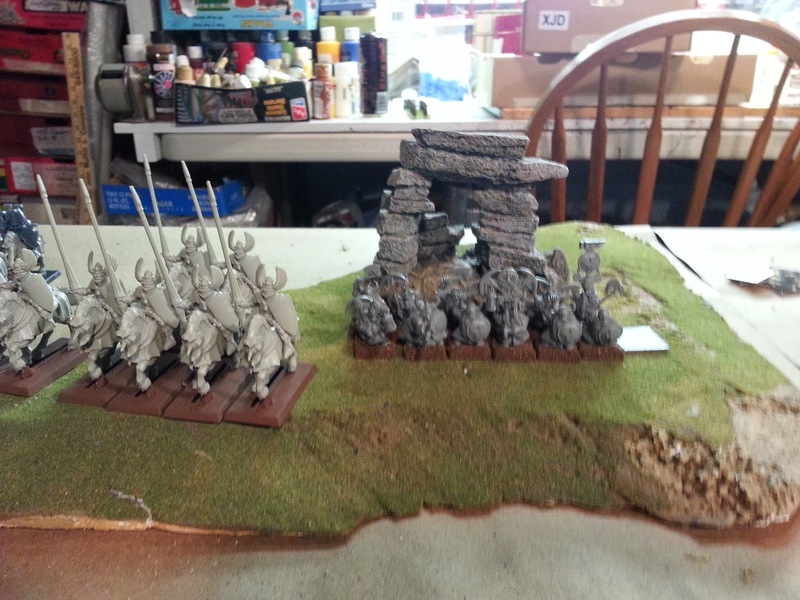 On the right, I moved my orc archers to the riverbank and returned arrow fire on the elves. 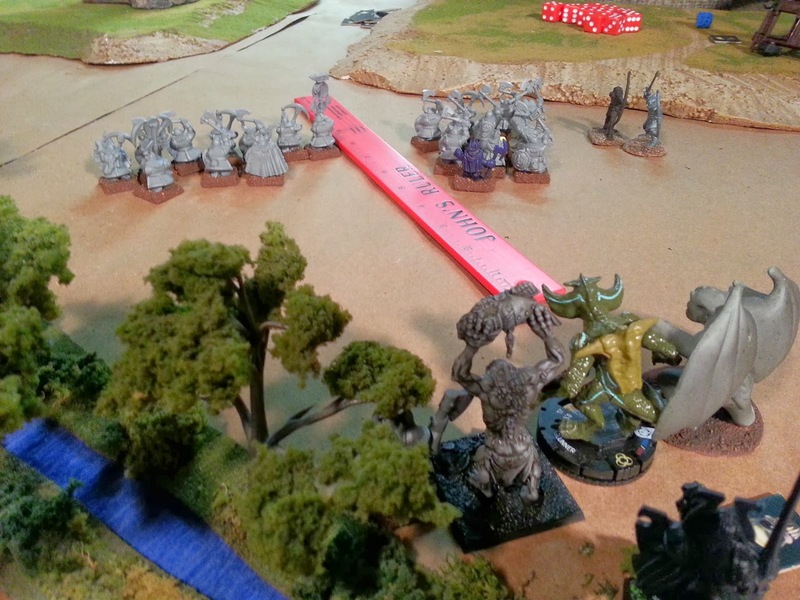 Orc bows decimated their enemy in a matter of two turns, much to the relief of the surviving chaos knight and trolls. 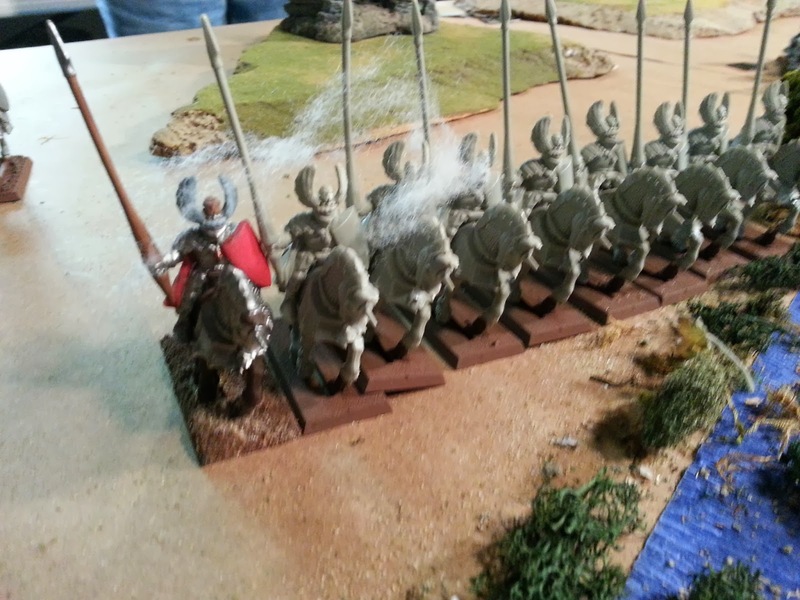 At the same time, I started slogging through the bog with my orc swordsmen. 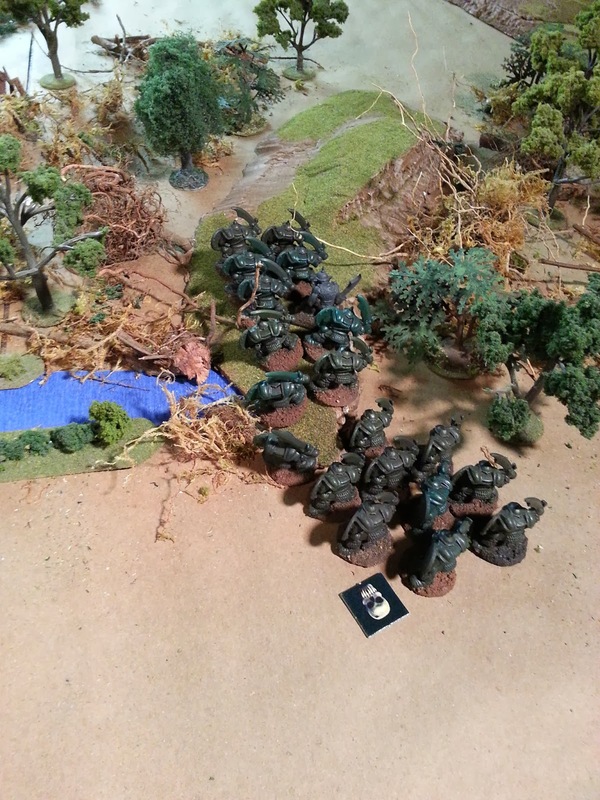 It would take them a while to break through, but I hoped to be able to turn the flank late in the game with them. 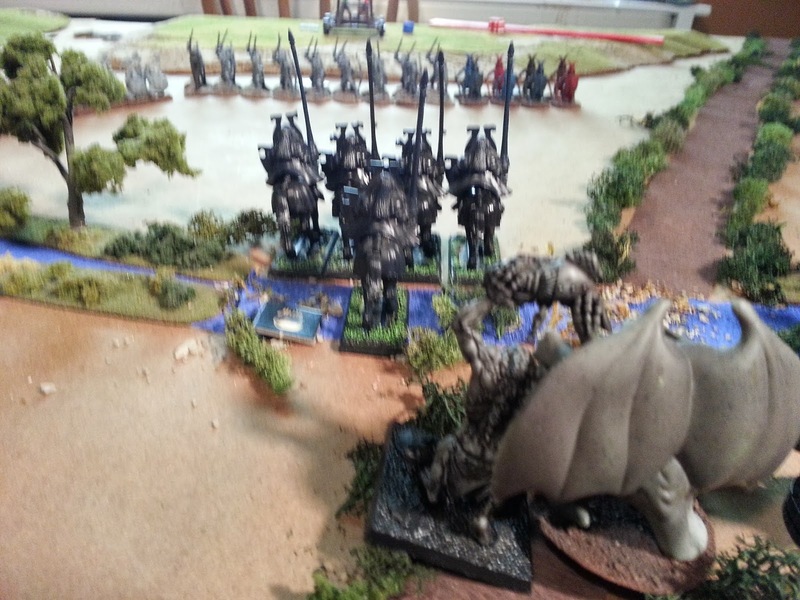 Back on the left, the heavy knights finally lumbered forward...straight into the webs of my spider riders! I was able to 'goo' the leader and three other knights, rendering them unable to attack, defend, or run. Score! In the center, Scott brought forward his dwarven axemen. I trundled my trolls forward to keep the dwarves from killing my remaining chaos knight and the fight turned bloody...for the dwarves. A couple of rounds in saw them running as fast as their stumpy little legs would take them! 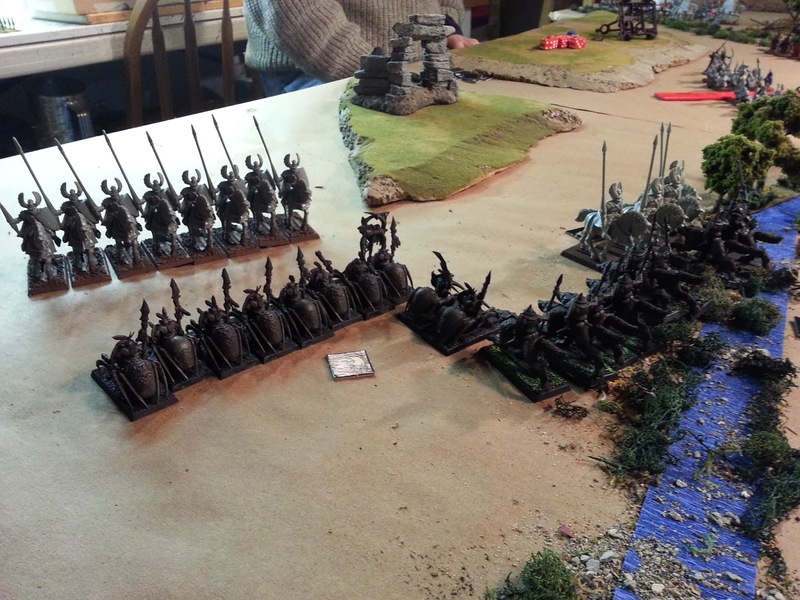 Finally, on the left, the battle was joined between one squad of heavy cavalry and the warg riders. Having some of their squad webbed, especially the leader, helped me, as their defense was hard to beat! 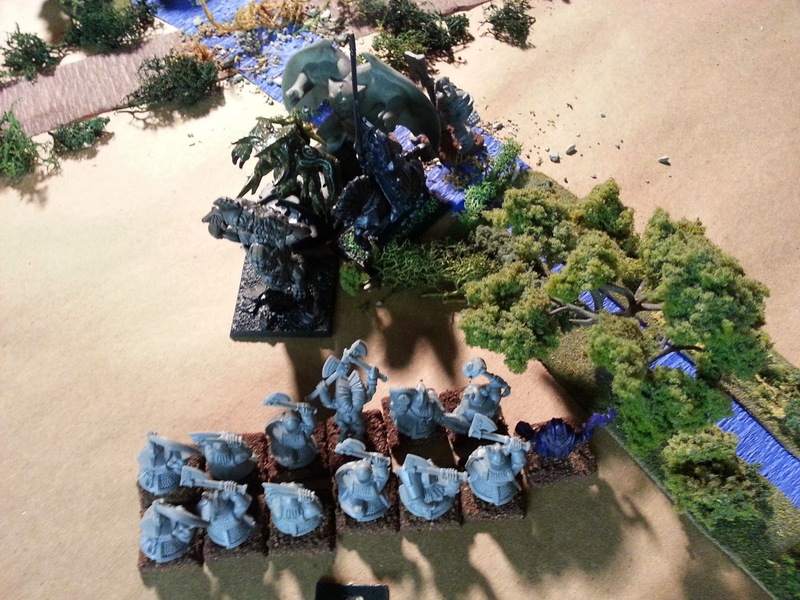 I was eventually able to bring my spider riders to the flank and decimate half of the squad, while Scott's other squad failed their activation and had to watch their brethren die. The center saw the trolls drive off the second dwarven squad. That, coupled with the elves being almost totally annihilated by my orcish arrows and the orc swordsmen finally breaking free of the bog and threatening the flank, made Scott capitulate. All in all, a grand evening. I'd like to thank Scott for not only hosting, but for also rolling crappy dice at the perfect time for me! FUBAR is definitely worth looking into for anyone wanting an easy, player-friendly set of sci-fi and/or fantasy rules.